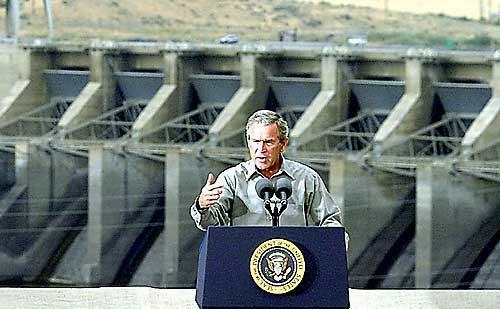 John Twa gave his perspective on breaching the Lower Snake River dams. He claimed that the four dams are creating a disaster to Idaho fisheries and destroyed farms, orchards, vineyards, homes, roads and bridges. He criticized the U.S. Army Corps of Engineers for selecting improvements to salmon passage and survival instead of breaching the dams. He touted the court-ordered spill program and said any criticism of it is a scare tactic. He did not mention all the Idaho dams that cut off spawning habitat or irrigation diversions that return heated and polluted water. I think the Idaho perspective is, "Keep your hands off our water, and focus on the Lower Snake River dams so the facts can be kept from the public." The truth is that major system improvements gave Idahoans the highest returns of salmon in decades, open fisheries for spring and summer chinook and steelhead with daily and seasonal limits higher than seen before. The loss of farms, orchard, vineyards, roads and bridges was a pittance compared to those created by irrigation, mostly from Ice Harbor reservoir. Over 100,000 acres, including the largest privately-owned orchard, thousands of acres of vineyards, corn, wheat and on and on. Twa ignores the less-expensive barge transportation of products from Eastern Washington and Idaho, or the transport of fuel, fertilizer and other commodities to these regions. Improving salmon survival was the right decision. It included development of the overflow weirs to make spillway passage safer and more effective for juvenile salmon. Unfortunately, the public and the judge tumbled to the false information that spill is the safest way to pass fish "over" the dams. It is not! Only one overflow weir is provided at each dam. The other spillways are undershot gates. Water shoots under them 40 to 50 feet below the reservoir surface at 35 miles per hour with an instantaneous pressure release that would give a human diver the bends. Overflow spillways don't carry air down deep where it becomes supersaturated in the water. Undershot spill gates cause gas supersaturation that persists from Lower Granite Dam and is added to by spill at each dam downstream to keep the level at 120 percent of normal. Fish that go under the spill gates suffer instantaneous decompression that can form bubbles in their blood. Gas supersaturation effects adult salmon swimming upstream too. I agree that facts and truth are essential in making the right decision.